Last year, famed cigar maker A.J. Fernandez introduced an extension to his New World brand called New World Puro Especial. At its core, the four-cigar line is Estelí through and through. Like so many cigars, the blending of New World Puro Especial took several years. Fernandez’s father, Ismael, helped with the endeavor. The final recipe includes Criollo ’98 from the San José farm, as well as leaves from La Soledad, La Providencia, and San Diego. All the tobaccos are aged three to five years. The Puro Especial formats include a Short Churchill (6 x 48), Robusto (5.5 x 52), Gordo (6 x 60), and a Toro (6.5 x 52). I picked up a handful of the latter vitola at my local tobacconist here in Chicago for about $9 apiece. The Toro’s smooth, moderately dry, dark chocolate-colored Nicaraguan Habano wrapper has only the thinnest veins and very tight seams. The cold draw is easy. The feel is consistently firm from head to foot, and the pre-light notes remind me of green raisin and cocoa powder. 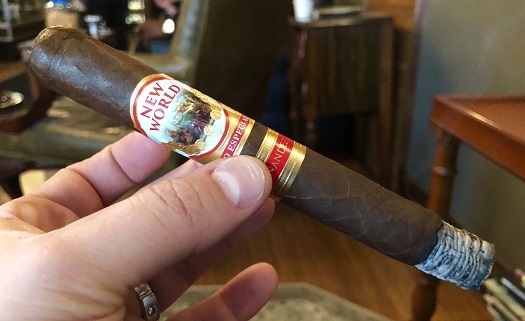 The New World Puro Especial is full-bodied from the get-go. It boasts heavy, leathery notes of espresso, dry wood, minerally earth, meaty char, and both red and black pepper. You’ll find abundant spice on the finish. After a half inch, the intensity steps off the accelerator, but the resulting profile remains strong, bold, and—at the very least—medium- to full-bodied. Thankfully, this is much more than a heavy-handed deliverer of power. As the Toro progresses to its spicy, full-bodied conclusion, attentive smokers will notice secondary flavors ranging from natural tobacco and cinnamon to oak and white pepper. That said, I don’t detect any semblance of sweetness, which would add balance and complexity. The physical properties are outstanding from light to nub. Each of my samples exhibited a straight burn line with no need for touch-ups along the way, as well as a sturdy ash, smooth draw, and average smoke production. I will be interested to see how time might impact the profile of the A.J. Fernandez New World Puro Especial Toro. Absent the sweetness that, I think, would improve the overall experience, this is still a fine full-bodied smoke with a pleasant taste and aroma. For that, I’m awarding it three and a half stogies out of five. The Puro is a favorite of mine and one fine smoke. I will always keep some in my humidor. Thanks for the article, as always.